The Baroness cut the most compelling modernist figure. 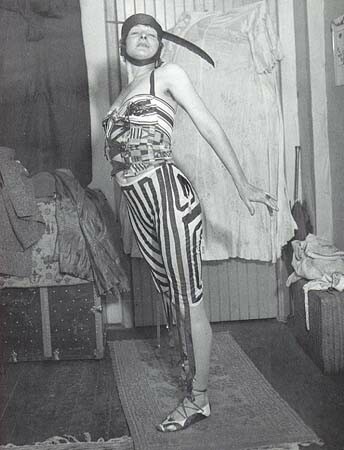 She literally wore New York dada, thus inventing it as a pattern of aesthetic costume to be worn so tight that it was her skin, her self. She was, as Irene Gammel puts it in this remarkable biographical study, an "assemblage of paradoxes embodied in one body." That the Baroness knew and inspired or inspiringly repelled nearly everyone associated with the rise of modernist practice in New York has been already part of the story, but it has never been so richly detailed. In Gammel's presentation the Baroness emerges as far more than an ingenue. She became a mature, self-conscious dynamic artistic force--and remarkably productive in her own right, not despite but because she exhausted herself up from the inside out. My students and I study the Baroness briefly during "chapter 2" of my course on modern and contemporary American poetry. Scroll down to the last lesson on this page and see various links to Baroness materials.